Daily rent of this apartment is especially attractive for whose who prefer to live in the center of St. Petersburg, near to the Nevskiy Prospect. 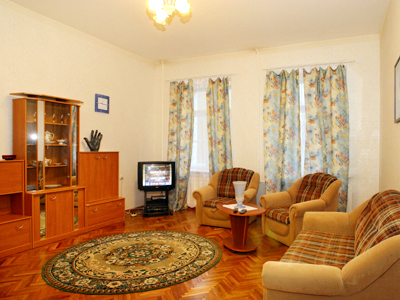 Two-room apartment consists of the bedroom (24 sq.m), a livingroom (24 sq.m) and kitchen (14 sq.m). In the bedroom there is a double king-size bed. Livingroom contains two folding double sofas and two armchairs, TV, coffee table and shelves. All furniture is modern and comfortable that makes livingroom cosy and stylish. There you have all needed home appliances such as TV with satellite channels, phone, iron and ironing desk. The kitchen is completely equipped by household appliances - refrigerator, washing machine, microwave oven, there is all necessary utensils. A separate WC includes toilet and convenient bathroom with a bath. Windows look to the court yard. There is a safe enter through the court yard, door is equipped by intercommunication system. The Mayakovskaya street crosses the Nevskiy, it takes five minutes to get to Mayakovskaya metro station and Vosstaniya Square, and takes ten minutes to walk from the Moscovskiy railway station.